the legendary “Vine of Souls”, is native to the Amazonian rainforest. This forest vine is the basis of an important native drink, ceremonially consumed in the Amazon basin and by isolated tribes in Peruvian, Colombian and Ecuadorean lands. Thousands of indigenous people of the region use Banisteriopsis caapi vine in sacred religious and healing ceremonies, as part of their traditional religions. Banisteriopsis caapi vine is the main ingredient in Ayahuasca (Yage, Yaje), a sacred medicine used for millennia in order to enter the sacred supernatural world, to heal, divine, and worship. 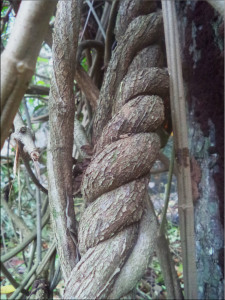 Ayahuasca evokes several cleansing and rejuvenating processes on a fysical, mental and spiritual level. In the initial process ayahuasca could bring the past under our attention; it reminds us about all the things from our past that we had forgotten. In this process, we face our internal world, we look into the abyss of mans psyche. If a man or woman carries any feeling of guilt or sadness due to his action or non action, the Ayahuasca will funcion as a mirror and brings it under our attention. During this process the Ayahuasca releases us from these negative feelings and – energies. This purification process can manifest itself in moments of crying, vomiting or diarrhea. At the moment that one is purified, it is possible again to start experience feelings of peace and love inside. This state ables us to understand and to forgive ourselves and re-establish the harmony. In the second phase, The Present, we can witness (personal) situations regarding work, health, family, friendship and love and can receive clear indications in how to deal with ourselves and others and maintain the harmony. Within these aspects Ayahuasca serves as an universal guide, the best counsellor, psychologist or doctor – The medicineman, but also participants in the Ayahuasca ceremony, can make diagnosis for themselves or others according to their needs. In the last process, The Future, we may observe the future for ourselves or others. It is possible to see how many children you’ll have, if you’ll marry or not and the future concerning work and projects, to give a few examples.